Texting is the new talking. That's no secret considering the fact that approximately 1 in 3 texters would actually rather text than talk. In our hyper-connected society of instant communication, it seems as though our heads stay buried in some kind of screen or device. But could the things that make our lives "simpler" actually be a detriment to our health? How is Texting Hurting Your Health? Let's first put the situation into perspective. Mobile device usage has increased significantly and will continue to do so into the future. According to text-neck.com, Americans spend 2.7 hours per day on average communicating and socializing on their phones, and they spend even more time looking down at their mobile devices for web searching and other uses. They go on to say that 75% of the world's population spends multiple hours daily hunched over their handheld devices. Studies also show that people under the age of 30 send an average of 3,000 text messages per month. That's approximately 100 text messages a day! Perhaps an even more unsettling thought is the fact that young children and toddlers are now given phones and tablets as play toys. One study found that 75% of children under 8 have access to a smartphone or tablet. It's also been reported that in the U.S. alone, nearly 1 in 5 kids under the age of 8 use a mobile device at least once a day. The problem with all this time spent with the head flexed forward is that it increases the risk of developing what has been termed as Text Neck. 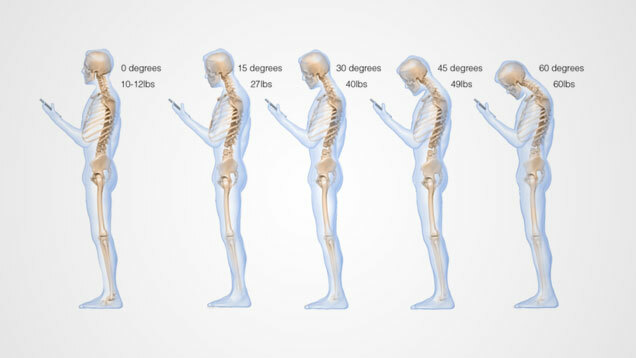 Basically, Text Neck is the modern day term for the more classical health condition known as Forward Head Posture. When Forward Head Posture begins to develop and your head begins to move forward away from its balanced position, the weight of your head begins to increase. In fact, for every 1 inch your head moves forward, the relative weight of the head over the body doubles due to the effects of gravity. So how can you prevent texting from wrecking your health? Take breaks from phones and laptops. It may seem outrageous, but try to remind yourself to take regularly scheduled breaks throughout the day (at least every hour or two). Practice good office ergonomics. Standing workstations are always easier on the body than sitting hunched over all day. Here are a few examples of great standing workstations. Embrace posture-focused exercises. Do exercises like yoga and Pilates, which focus your attention on attaining the right posture. You will become more aware of the way you use your mobile devices in this way. There's even an app to help. For Android users only, there is currently an app that alerts you when the angle of your phone is putting you at risk. Check it out! 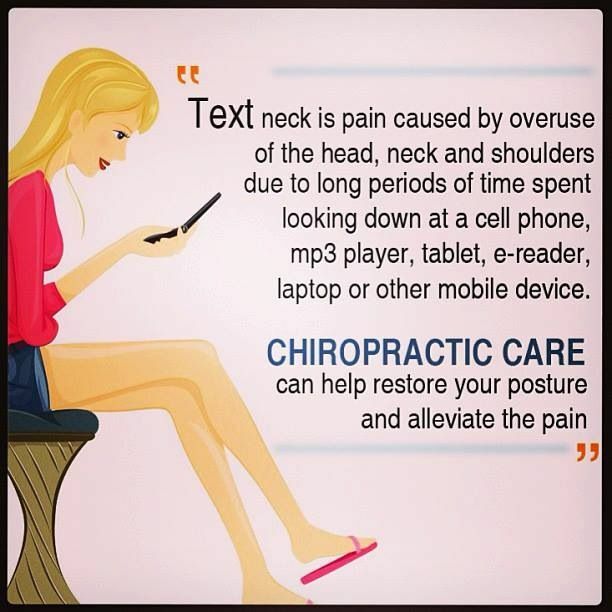 If left untreated, "Text Neck" can lead to the inflammation of the neck muscles, ligaments, and nerves, as well as permanent arthritic damage and increased curvature in the spine. Text Neck affects all generations. Early prevention is key to reducing and eliminating symptoms. Only by implementing small habitual lifestyle changes can you expect to see longstanding relief. How about you? Do the symptoms listed above describe pain and discomfort you've felt before? In many cases, a non-surgical spine specialist will be able to alleviate and reverse these ailments. Call us to schedule your appointment to relieve and prevent the painful effects of long-term handheld device usage.